Have You Ever Been (To Electric LadyLand). Made in Japan. This CD is original. Disc 1 is EX- condition. This CD sound has No noise and No skip. Little Miss Strange. Cross Town Trafic. And The Gods Made The Love. JIMI HENDRX / Electric Ladyland. Have You Ever Been (To Electric Ladyland). JAPAN 2CD, 2nd Press in 1989, P36P22004/5. Burning Of The Midnight Lamp. Made in Japan. It's so hard to find even in Japan! 6 CD BOXSET 2007 VOODOO CHILE RECORDS. NEW AND SEALED. 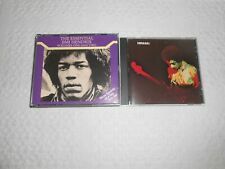 CD JIMI HENDRIX "THE JIMI HENDRIX EXPERIENCE. New and sealed. AUTHOR : JIMI HENDRIX. TITLE: THE JIMI HENDRIX EXPERIENCE. FORMAT : CD. Images shown may, occasionally, belong to a catalog and could vary to the ofered item. The Jimi Hendrix Experience - Electric Ladyland 50th Ann. (NEW CD BLURAY BOXSET). Have You Ever Been (To Electric Ladyland). This deluxe box set includes the original album, remastered by Bernie Grundman from the original analogue tapes. Deluxe 4 CD Album Set With Extensive Booklet ~ Card Book Format. Title: ELECTRIC LADYLAND: 50TH ANNIVERSARY DELUXE EDITION. Artist: HENDRIX,JIMI. Format: CD. Condition: New. Title: JIMI HENDRIX purple haze. Format: 2X CD, compilation, box set. JAPAN CD, 1st Press 1987, 55XD-626/7, Double Jewel Case. Made in Japan. It's so hard to find even in Japan! USA,Canada. It was the golden age of rock. Music was king and the dj's were just as popular. THIS IS ONE OF THEM. And every one you buy is an original, not a copy, not a remake - all are limited editions in the hundreds at most and most, like this special show, much less. It was the golden age of rock. Music was king and the dj's were just as popular. THIS IS ONE OF THEM. Picture yourself back in the late 50's or 60's, even the 70's. You were at one with to your transistor radio listening to the top 40 presented by your local radio station. It was the golden age of rock. Music was king and the dj's were just as popular. THIS IS ONE OF THEM. They were first distributed on reel to reel tape if the show goes back that far into the 60's, then later on lp, later on CD and even later (after 2000 for most shows) on CDR. This is a New mint condition 2-CD set (two jewel cases housed in a cardboard outer slipcase) still factory sealed with an old price sticker on the front of the wrapper. It's not a promo or cutout. 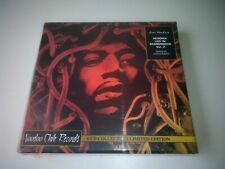 JIMI HENDRIX Electric Ladyland PROMO EMPTY BOX for mini lp cd Free Shipping! This box is slipcase style box, not a drawer style. this is a empty box(no cd included). USED: There are many scratches and scuffs on the CD, it plays perfect on myside. SEALED: The CD has never been opened. Santana, Jimi Hendrix, John Mayall, Booze Brothers, Yarbirds. Guitar Heroes (1999). The Largest Collection in Germany. Second Hand and New. Here you may buy music at very low prices. Now, as to the show itself. The show featured the kinds of blues that the Blues Brothers excelled in - blues with a rock touch although you will hear plenty of traditional blues as well. It is an exciting hour! Mint and unplayed double CD, PRINTED IN HOLLAND. FOR THIS CD! We are specialized in collectable cds, and use our own scans to give as much as possible information. Music is Love. CD 1 Electric Ladyland. 1-2 Have You Ever Been (To Electric Ladyland) 2:10. At Last. The Beginning: The Making Of Electric Ladyland: Blu-ray. BR-2 Have You Ever Been (To Electric Ladyland). BR-17 The Making Of Electric Ladyland. RELEASED BY THE "PALI GAP" LABEL, THIS IS A LIMITED EDITION 3CD BOX SET OF THE FAMOUS 1969 "DEVONSHIRE DOWNS" CONCERT FROM "JIMI HENDRIX". THIS RELEASE IS LIMITED TO 1000 COPIES WITH EACH ONE BEING INDIVIDUALLY NUMBERED & ALSO CONTAINS AN EIGHT PAGE BOOKLET. Title: ELECTRIC LADYLAND: 50TH ANNIVERSARY DELUXE EDITION. Artist: HENDRIX,JIMI. Format: CD. Missing Information?. Electric Ladyland - 50th Anniversary. 50th anniversary edition of "Electric Ladyland". "At Last. . The Beginning: The Making of Electric Ladyland," ,etc. Jimi Hendrix Experience. 3CD Blu-ray. This is 3CD Blu-ray - Limited Edition. Smash Hits. There are five Promo obi in all. with OBI (NM). PROMO BOX (NM) : made in Japan by disk union. Label : Universal-Music (made in Japan). - Album title (5 titles)-. with 1 Sleeve (No disc). Format : CD. Available as a 3CD/1 Blu-ray set, it includes the original double album, now newly remastered by Bernie Grundman from the original analogue tapes. The previously unreleased live albumJimi Hendrix Experience: Live At the Hollywood Bowl 9/14/68,part of Experience Hendrix’s official ‘bootleg�� series. The two hour version contains the first and last hour of the week's four hour version. HERE ARE THE GREAT SONGS YOU WILL HERE. CUE SHEETS ARE IN EXCELLENT CONDITION AS WELL. HERE'S ANOTHER EXTRA!